Holland & Barrett Feverfew Migraine Relief Review - Does It Work? Migraines are the third most prevalent illness in the world and can the sixth most disabling illness in the world. Getting your migraine under control can be challenging. With so many different migraine relief products available on the market, it can be hard knowing which will offer real relief. This Holland & Barrett Feverfew Migraine Relief review is gong to take a closer look at the facts and details to learn more about how this supplement works and to see if it’s worth trying out for effective results. The manufacturer claims that their herbal medicinal migraine treatment is effective in the prevention of migraine headaches. The only primary ingredient in this supplement is Feverfew Dry Herb. Every serving has 100 mg and contains white dextrin, colloidal anhydrous silica, talc, magnesium stearate, hypromellose, titanium dioxide. Feverfew contains a chemical called parthenolide that has anti-inflammatory effects and is believed to work by decreasing factors in your body that cause migraine headaches. The recommended dosage is one capsule daily at the same time of day. You should swallow the capsule with water or liquid. The capsules are not meant to be chewed. Full results can be expected to be seen within three months of continual use. Migraine Relief is not intended for children under the age of eighteen. If your symptoms worsen or do not improve after eight weeks, you should talk to your doctor. Talk to your doctor before taking this supplement if you are pregnant, nursing or have a known medical condition. We found heartburn, constipation, diarrhea, fast heart rate, high blood pressure, arthritis, changes in blood or liver function or kidney problems to be common side effects associated with Feverfew. 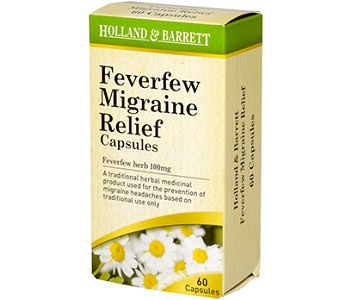 Holland & Barrett Feverfew Migraine Relief is available to purchase directly from the manufacturer. One 30-capsule bottle costs $10.56. They do not offer any discounted bulk purchasing packages. The manufacturer offers a meager thirty-day money back policy. We were unable to find much consumer feedback regarding this migraine treatment but the little we did see was mostly negative. 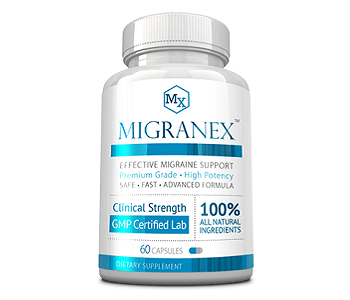 Consumers claimed that taking this supplement did nothing to relieve their migraines and reported that this product does not work. Holland & Barrett Feverfew Migraine Relief appears to be a decent migraine treatment. Its primary ingredient, feverfew, has been shown to possess the ability to reduce the intensity of a migraine and this product is backed by a manufacturer’s guarantee which is always reassuring to see from a manufacturer. However, while the manufacturer does offer a money back policy, their policy is weak. Comparatively, their policy is one of the weakest we’ve seen throughout our research. Thirty days is not a fair amount of time to be able to determine whether or not a supplement is working for you. Furthermore, the consumer feedback does not elicit confidence in this product’s ability. With so many different migraine treatments available on the market, you are better off choosing one that is backed by a strong manufacturer’s guarantee for consumer protection and one that has been proven to be effective.